The Washington Spirit Reserves displayed their attacking dominance by defeating their conference rivals, Braddock Road Stars Elite, with an end score of 6-0 and crowned the Northeastern Conference Champions. The Reserves advance to the W-League Championships at the end of July. Despite a rather slow start, the Spirit Reserves were able to create numerous offensive opportunities and complete their home-field win-streak in superb fashion. The first goal for the Spirit came in the ninth minute off a cross from Sam Lofton to Ashley Herndon, who gracefully volleyed the ball into the back of the net. Twenty minutes later, the Spirit Reserves were able to capitalize on a corner from Ashley Herndon to Aaran Parry. Despite the goal differential, Braddock Road was able to create several stints of attack as a result of offensive pressure from their forwards, most notably Marisa Park. Stars Elite had several threatening offensive possessions, but were rarely able to create a goal scoring opportunity. The second half was played mostly in the Spirit’s attacking half, as they scored four more goals in the remaining 45 minutes. Kelsey Pardue had the first goal of the half in the 49th minute off of a cross from Aaran Parry. The third goal for the Spirit triggered a series of substitutions, but the offense did not slow down, as they continued to threaten the Stars Elite back line. In the 76th minute, Emily Bruder put the Spirit on top, 4-0. Three minutes later, Bruder had her second goal of the night off of a pass from Ashley Herndon. The final goal for the Spirit, and of the match, was scored by Kelsey Pardue in the 83rd minute off of a free-kick just outside the penalty box. 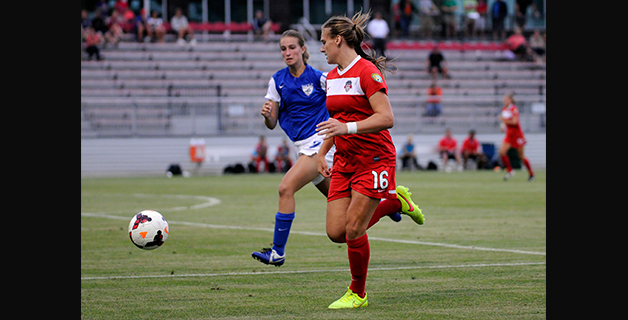 The Washington Spirit Reserves will try to continue their impressive win streak on the weekend of July 25-27 at the IMG Academy in Bradenton, Florida as they compete for the 2014 W-League Championship.